The League of Extraordinary Red Heads will once again stage its Night of the Walking Red October 1 at Brown's Brewing Co. in Troy. Now, therefore, I, Lou Rosamilia, Mayor of the City of Troy, do hereby proclaim that, on Oct. 1, 2014, our fair city shall also be known on this day as GINGER CITY, USA, a Shangri-La or Brigadoon for red heads around the world to visit and "kick back in," not be kicked. 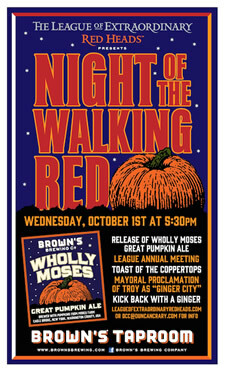 The night will also include a "Toast of the Coppertops" with Brown's Wholly Moses Pumpkin Ale. It starts at 5:30 pm -- admission is free. And it's our understanding that non-redheads are welcome. Probably. As you know, Duncan worked with on the Rail, River, Hudson tour this year. Finally...a club for just us redheads!!! As a card carrying member since it's inspection my only gripe is the allowance of dye jobs, but imitation is the sincerest form of flattery...and it is massive fun to talk to people who understand the sunscreen issues and what a redhead burn is really like.